As a teenager in her native Jeddah, Basma al-Sulaiman persuaded her mother to purchase an artwork for her. It was al-Sulaiman’s first acquisition, a painting by local Saudi artist and Central Saint Martins graduate Safeya Binzagr. With the participation of Ayman Yossri, Basma Al Sulaiman and Sara Raza. What characterizes the emerging art scene in the Gulf region? What place does Saudi Arabia hold, and more specifically the cities of Riyadh and Jeddah, in its development? In what direction are the artists, collectors and managers who work in the region looking? Blouin Artinfo Art + Auction’s Power 100 Slideshow. Saudi collector Basma Al-Sulaiman held the second BASMOCA (Basma Al-Sulaiman Museum of Contemporary Art) launch event at her London residence on 8 June. The world’s first virtual art museum was inaugurated in April in Jeddah and features a selection of international artworks from Al-Sulaiman’s private collection. The high-energy, low-profile collector Basma Al Sulaiman resists easy classification. She has built a collection that is remarkable for the breadth of its holdings in Chinese, Indian, and South Asian contemporary art. What characterizes the emerging art scene in the Gulf region? What place does Saudi Arabia hold, and more specifically the cities of Riyadh and Jeddah, in its development? In what direction are the artists, collectors and managers who work in the region looking? Click here to see the conference. BASMOCA has been featured in the prominent German Magazine ART INVESTOR on the February Issue. 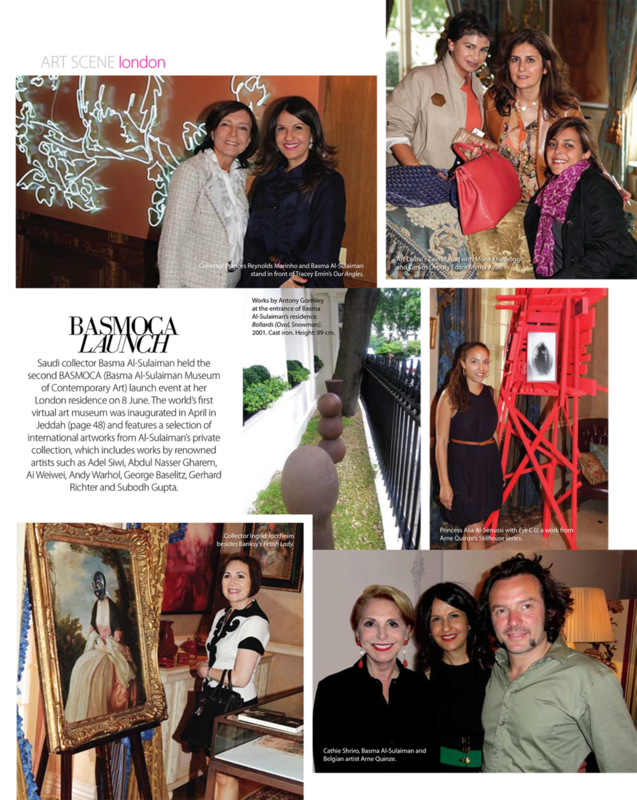 BASMOCA has been featured in Turkey’s very own contemporary art magazine Genc Sanat Art Magazine’s September issue. BASMOCA director and founder Basma Alsulaiman will participate in Panel of International Women Collectors as part of the Elgiz Museum of Contemporary Art, Istanbul celebrating a decade of commitment to contemporary art in Turkey along with Patrizia Sandretto Re Rebaudengo and Ella Fontanals Cisneros, taking place on September 16th, 2011. The panel discussion will be moderated by BASMOCA Creative Director, Michele Codoni. BASMOCA has been featured in one of Saudi Arabia’s most prominent art and lifestyle magazines, Oasis issue 16. BASMOCA has recently been featured on Jeddah city’s guide magazine Destination Jeddah. Saudi Arabia’s dedicated Design Magazine featured BASMOCA in their May-June 2011 issue. BASMOCA has recently been featured on SQUA.RE, a luxury lifestyle online magazine and guide based in London. BASMOCA is proud to announce that shortly after the launch on April 24th, Second Life chose to include BASMOCA as a Featured Destination on their own website. Additionally the number of visitors at BASMOCA up till today has been greater than 11,000 people. 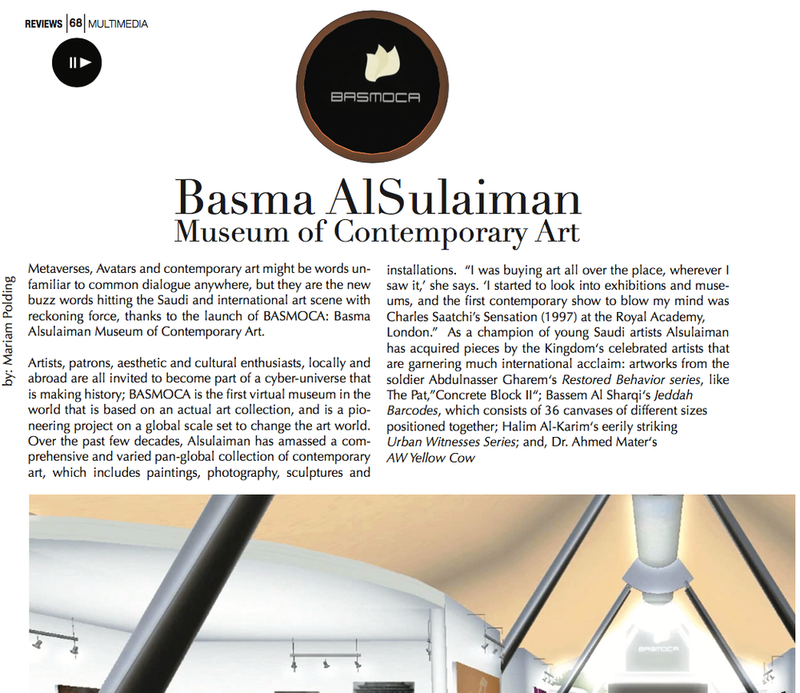 BASMOCA: the Basma Alsulaiman Museum of Contemporary Art is proud launch. Being the first virtual museum of its kind, BASMOCA is set to take over the art and museum world over. Featuring the internationally varied collection of Saudi art collector and patron, Basma Alsulaiman, login to experience the work of such renowned contemporary artists as Gao Brothers, Adel El Siwi, Subodh Gupta, Anslem Kiefer, Ai Weiwei, Abdulnasser Gharem, Tracey Emin, Zeng Fanzhi, Banksy and many more. BASMOCA proudly lent four of its artworks to W Investments headquarters in Zurich. The artworks are “Islands Are Forever” (water colour on paper, 2010) by Gigi Scaria, and “Ton” (oil on canvas, 1999) by Kazuo Shiraga, two paintings from Zhang Xiaogang’s “Blood Line series” (both water colour on paper, 2002) and the tetraptych piece “Four Seasons from Shan Shui Tattoo series” (lambda prints, 2005) by Huang Yan. We thank Canvas Magazine founder and Editor-in-chief Ali Khadra and his wonderful team for this article. 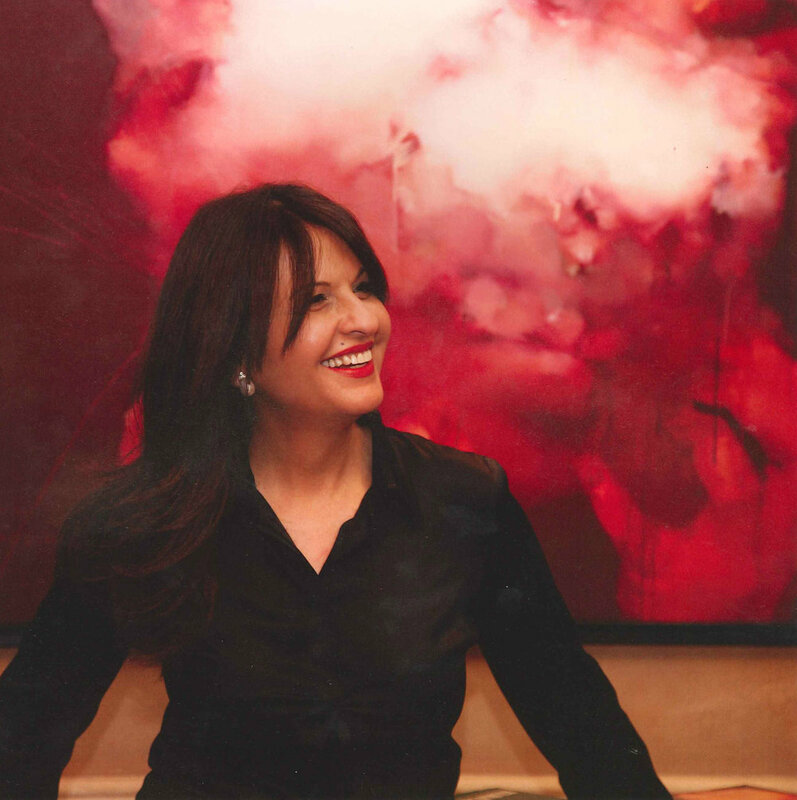 Basma Alsulaiman and her renowned collection of international contemporary art have been featured in this stunning new book about art collectors in the Middle East, titled; Art & Patronage: The Middle East. Written by Hossein Amirsadeghi and Maryam Homayoun Eisler, and published by TransGlobe Publishing, the book launched in London last November.